Five dancers/actors are celebrating the falling of a fence – to freedom? 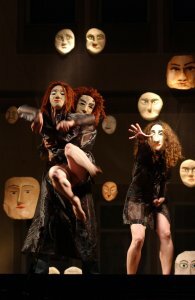 Dance - masks - singing: From wearing masks to stripping off masks - to the beauty of the mask. From chaos to hope. Accompanied by contemporary Israeli songs. Nimrod Freed: His works are characterized by the combination of dance, live music and acting. His work was presented in New York City (DTW, The Theater of the Open Eye, River Side Dance Festival, DIA Art Foundation, etc.) and in many venues in Israel (Tel Aviv Museum of Art, Suzzane Dellal Center, Israel Festival etc.). He has been in New York City for 10 years, after being invited to be part of Kei Takei's Moving Earth Company, with which he performed annually in New York and on tour around the U.S, Japan and Israel. Nimrod and his company received Du - Oman Festival award in the year 2000 from Habima, the national theater of Israel. Nimrod teaches in several colleges in Israel: The Jerusalem Academy of Music and Dance, The State Teacher's College - Seminar Hakibbutzim, and in The Acting Studio of Yoram Levenstein. In the last eight years he is the Artistic Director of On the Edge Festival at Beit Tami, Tel Aviv. He received an M.A from Columbia University, New York City.